The men and women of the Westminster Police Department are committed to the philosophy of community oriented policing and strive to build partnerships in our community. 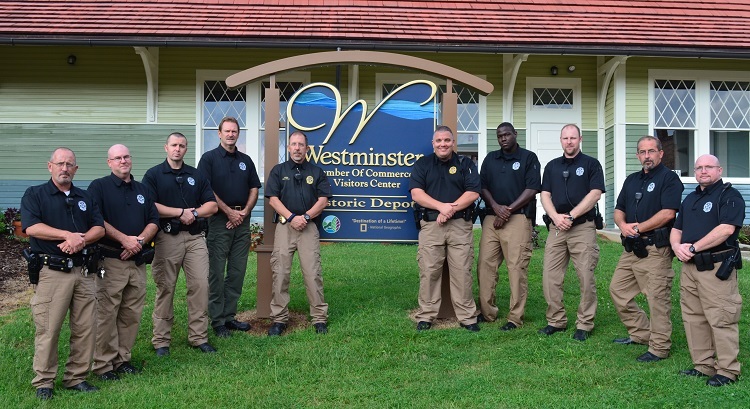 It is the mission of the Westminster Police Department to be a service oriented agency that effectively provides quality police services to our community, by promoting a safe environment through police-citizen partnerships, with an emphasis on mutual trust, integrity, respect, and professionalism. We strive to treat all people with respect, fairness and compassion. Our officers are determined to serve as a deterrent to crime, develop relationships with community groups, residential and business organizations, and promote an environment receptive to tourism and visitors. The department has a tradition of commitment to the community and all of those who visit, shop, and conduct business in the City of Westminster. By fostering a spirit of involvement and open communication between citizens and officers, we seek to build a partnership with the community we serve. We are also dedicated to our personnel by providing continuous training and educational development, as well as career enhancement opportunities. Our commitment to our community is embodied by the dedication and professionalism of the men and women of the Westminster Police Department Our officers have a deep and abiding interest in the welfare and quality of life of our citizens. The Westminster Police Department is a service oriented agency that effectively provides quality police services to our community, by promoting a safe environment through police-citizen partnerships, with an emphasis on mutual trust, integrity, respect, and professionalism.